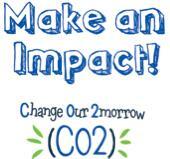 After the Make an Impact Change Our 2morrow (CO2) School’s Challenge launched for the first time in 2012, only one teacher in Whatcom County chose to take on the challenge- Criss Forslund at Kulshan Middle School. It was a great success for Kulshan and they won $1000 for participating, but the RE Sources Sustainable School’s team saw much more potential for the program. For the 2013 Challenge, Aloca Foundation agreed to sponsor RE Sources in a pilot project to see how we could offer on-the-ground support to improve the success of the Change our 2morrow School’s Challenge. We are working with Kulshan Middle School and Alcoa to help rally enthusiasm from the school and community, provide in-class presentations and put on a Green Fair to involve the parents and local organizations. The program itself is designed to spread the word about energy efficiency and challenges students, parents and teachers to learn how to use energy more efficiently while having a chance to win a $5,000, $1,000, or $500 grant from Alcoa Foundation. The winning schools will be determined based on the highest number of Make an Impact carbon calculator and pledge list completions during the challenge, as a percentage of the school’s student population. The initiative runs from March 1 to March 31, 2013. We are excited to help launch CO2 Schools’ Challenge at Kulshan Middle School and promote the benefits that energy efficiency can bring to your wallet and the environment. Complete the carbon calculator and/or pledge list on behalf of your favorite local school. Browse the Make an Impact website to learn about energy efficiency and apply what you have learned at home! Share your energy efficiency story by submitting an In 3 Words photo and inspire others to take action. Learn more about In 3 Words here: http://alcoa.c2es.org/about/3-words. If you would like to volunteer for CO2 Schools’ Challenge, contact Riley Grant, (360) 733-8307, RileyG(at)RE-Sources(dot)org. A comprehensive outreach program of educational workshops and hands-on activities to support local action and encourage sustainable change. Riley Grant is the Sustainable Schools Program Manager for RE Sources for Sustainable Communities. She can be reached at RileyG(at)RE-Sources(dot)org. Congrats Kulshan for winning $1000 for participating. What do you know about it - trądzik młodzieńczy ? Would you tell me some more about dexavelan?